Great Brickhill suffered a frustrating defeat under the Duckworth-Lewis system to Cumnor on Saturday on a day that saw the remaining fixtures in Cherwell Division 1 abandoned for rain. Batting first, Cumnor posted 244-9 from their 50 overs, with Kieron Burke taking 3-65 and two wickets apiece for Garth Davson and first team debutant Jack Woodhouse. 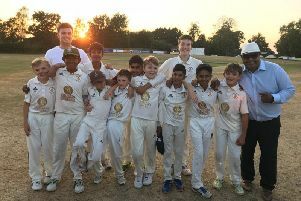 After the rain intervened, Brickhill were left stranded on 97-4 from 20 overs, the minimum number necessary to constitute a match, and 20 runs short of the adjusted D/L target. They do however remain top of Division 1 with two matches played, and take on Twyford at home next week. In Division 3, Great Brickhill 2nds managed just 32 overs against Minster Lovell 2nd XI before rain curtailed Minster Lovell’s innings on 183-5. Lawrence Armstrong made a welcome return with two wickets and there were wickets too for Dave Allen, Glenn Burrows and Lee Morgan while veteran keeper Andrew Mitchell grabbed two catches and a stumping. The result leaves them sitting second from bottom of the table ahead of their game with Bicester & North Oxford.